The Chevrolet Aveo is just like that. But it isn’t obscure. The Aveo came out in the US for the 2004 model year. I distinctly remember when it came out, because every single journalist realized immediately that it was outclassed, even back then. This didn’t stop GM from selling it, largely unchanged, for eight model years. So what were the Aveo’s problems? Well: how much time do you have? To me, the biggest was overall lack of refinement. I spent hours driving Aveos when I was employed for a summer by Enterprise Rent-a-Car, who loved the Aveo because they could buy it from Chevy for like four grand. During those hours, I can’t remember how many times I had to adjust the radio to a higher volume simply because I was now on the highway. It wasn’t just noise: the ride was surprisingly awful and the steering wheel was constantly getting bounced around by rough roads. This may suggest that the Aveo handled well, but it didn’t, largely thanks to wheels the size of a Super Duty pickup’s center caps. The problems weren’t confined to its driving experience. One of the Aveo’s biggest problems is that timing belts are notorious for breaking at around 50,000 miles. Fifty. Thousand. Miles. Fortunately, there’s no shortage of used Aveo engines from cars that were totaled after a light accident in a parking lot. The Aveo was so bad that the second-generation car – still called Aveo in nearly every other market – had to be renamed Sonic for us North Americans. It’s a big improvement. But I’ll reserve full judgment until they start hitting the 50,000-mile mark. I recently tagged along with my older brother to a car dealer so he could buy a car for his son. It was a Chevrolet dealer, and our salesman, Leif, sat us down to figure out what my brother was looking for. After telling Leif that he wanted something economical, safe, and relatively cheap (his son is starting college this fall), Leif left us to “talk to the boss.” He came back and said the word, the ONE word that I warned my brother against. “How about an Aveo?” My brother and I exchanged a glance, smiled, and shifted uncomfortably on our plastic picnic table bench (the showroom was set up for a “summer sale”). My brother looked at Leif and said “What else do you have?” Leif didn’t seem pleased. At least 10x. The Sonic is a surprisingly good car considering it’s similar in concept to the Aveo. As I recall, the Aveo sold decently because of it’s roominess. That’s a pretty good ad. Wasted on that car, I think. Great ad. I couldn’t believe Aveos got worse gas mileage than the larger Cobalts too. 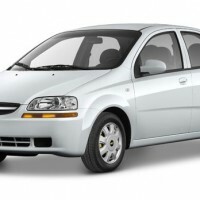 I do think of the Aveo as the herald to Daewoo’s growing influence. They probably sold more Aveos than all their US Daewoos combined and now they’ve designed the Cruze, Sonic, Spark, Moka/Encore for the entire GM world. Rented one of these in 2008 or 2009, and I had to avoid the highway after the first day because I literally could not get it to go straight above about 50 mph. Not just a little bit of wandering. Like SCARY wandering to the point that I was afraid of getting pulled for DUI. Rented a Chevy Sonic a few months ago and it wasn’t much better. Chalked it up to just another FAIL by GM. 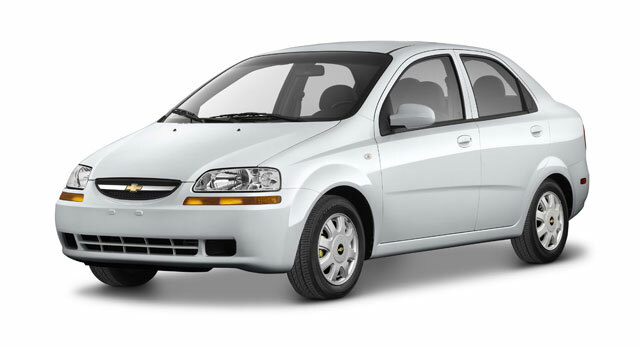 The mention of Aveo and Enterprise in the same sentence reminds me of the time an local branch Enterprise Rep insisted, unrelentingly, that an Aveo was “compact” class. I drove straight to the regional branch with a better selection and traded it for a Corolla. This was a first for me, since Corolla’s are typically the model I am most likely to swap at the next branch down the road. I’ve never owned a domestic car and never planned on owning one. And if, heaven forbid, I did buy one, it sure wouldn’t be a General Motors vehicle. Then I drove a Sonic hatchback with the turbo engine and six speed transmission. It turns out that there isn’t anything in its class that I liked better. The Honda fit was too buzzy (though I like the interior space). The Kia and Hyundai twins were too wallowy in the turns. The Ford fiesta was too small (and I really missed the turbo). The sonic had great steering and a reasonably planted chassis, runs much quieter on the freeway than the next best (the fit), and feels peppy – sort of like an old school vw golf. I bought one and am really enjoying it. Now that is proof to me that Chevy learned its lessons from the dismal aveo.